Test consisting of two, irregular, spherical, medullary shells and one or two spherical cortical shells without radial main spines. Inner medullary shell spherical to subspherical with irregular outline and large irregular pores, 3-5 on half the circumference; joined to the outer medullary shell by numerous (20-30 or more) cylindrical, thin to heavy beams which arise from its surface. Outer medullary shell spherical to subspherical with irregular outline, with large irregular pores similar to those of the inner medullary shell, 7-10 on half the circumference, joined to the cortical shell by numerous (50-100 or more) radial beams arising from its surface; beams range from thin, delicate, and cylindrical to heavy and three-bladed, and they generally extend as short, heavy thorns on the surface of the cortical shell. Cortical shell spherical, with rough surface and generally thick wall, with unequal, irregular pores of all shapes and sizes, slightly smaller than those of the medullary shells, 10-20 on half the circumference. Several specimens with a double cortical shell [=A. antarcticum] with a narrow space between, together giving the outer shell a spongy appearance; outer cortical shell similar to inner one. In some specimens the inner medullary shells are indistinguishable, together giving the appearance of a solid spherical mass of loose spongy meshwork. Measurements; based on 30 specimens from stations 27, 34, 60, and 194: diameter of outer cortical shell (3 specimens = A. antarcticum) 221-264 µm. of inner cortical shell 172-239 µm, of outer medullary shell or inner solid spongy sphere 98-129 µm, of inner medullary shell 43-62 µm. Cortical shell a somewhat irregular sphere, thin-walled, with 9-12 subcircular to subangular pores on a half-equator. 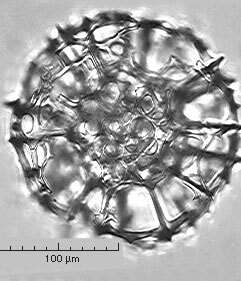 Medullary meshwork irregular, more delicate than, but otherwise similar to, that of Actinomma antarcticum, with an internal shell having 2.5-3 subcircular pores on a half-equator. Numerous radial beams extend from the outer surface of the medullary meshwork to the cortical shell and sometimes extend externally. Additional, more delicate spines, originating on the cortical surface, are present in some specimens. Occasionally, these spines support a delicate extracortical shell. ... the species exhibits characters intermediate between A. antarcticum and A. arcadophorum. It may be distinguished from the former by its simply latticed cortical shell and more delicate medullary meshwork. Diameter of cortical shell 164-227µ; of medullary shell 81-100µ. Inner medullary capsule approximately one-third the diameter of the medullary meshwork.